Sometimes, you just have to take the bad news with the good news. So, when your dentist tells you that you have a cavity, you can feel better knowing that the repair will look completely natural. With tooth-colored fillings in Harrisonburg, your tooth will be strong and healthy and your smile will be white! Tooth-colored fillings are made of composite resin material, which blends medical-grade plastics and small glass particles. This material allows the dentist in Harrisonburg to specify a color of composite that matches you natural tooth. After the filling is completed, you won’t be able to tell the difference between the composite material from the rest of the tooth’s structure. Unlike metal, the composite resin used for a tooth-colored filling is very safe. A metal filling often contains several metals, including mercury. Mercury is added to the amalgam of metals to make the filling stronger and the materials more pliable. However, there can be health consequences to mercury. Studies show that this heavy metal may enter the bloodstream and the respiratory system, thereby migrating throughout the body and causing problems. Further, a metal filling is wedged into a tooth once decay is drilled away. 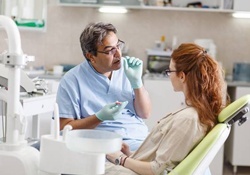 Consequently, the filling could expand and contract, making it possible for bacteria to enter the remaining tooth structure and cause infection. A tooth-colored filling, on the other hand, bonds with the remaining tooth. Therefore, the tooth is made stronger, and there is no risk of leakage. Placing a composite filling usually takes a bit longer than a metal filling. That’s because the tooth must be kept clean and dry while the cavity is filled with composite resin. 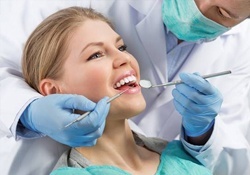 First, the dentist administers a local anesthetic to numb the tooth and surrounding tissue. Then, decay is removed and the tooth is prepared. A weak acid is brushed on your tooth to roughen the surface—kind of like sandpapering a piece of wood before painting. Next, a bonding agent is applied and the composite resin material is shaped layer upon layer. Each layer is dried with a curing light. Your newly repaired tooth will look, feel and perform as well as your other natural teeth. To keep your tooth-colored filling looking good—and possibly avoid the need for another one—you must stick to a stringent oral hygiene plan every day. Brush your teeth at least twice daily with fluoride toothpaste and a soft toothbrush. Remember to floss, which is the best way to remove plaque and other debris that can get stuck between your teeth. Lastly, don’t have too many sugary snacks, sodas or other sweetened beverages, and be sure schedule dental checkups regularly at Harrisonburg Family and Cosmetic Dentistry.